Summer is coming. And with it comes the merciless heat of the noonday sun. In this online guide, you’ll learn about the risks to your backyard chickens associated with heat exposure, as well as tips and tricks you can use to cool your backyard flock down. Heat-related problems for your backyard chickens starts with a quick drop in production and efficiency as the heat rises. For your meat birds, they’ll stop gaining weight. For your layer hens, the feed-to-egg ratio is reduced and your chickens often completely stop laying altogether. If your chickens aren’t given a chance to cool down, the chicken’s biological system grinds to a halt. An observer will notice that the birds are just lying around limply. And finally, death occurs after prolonged heat stress. Of course, how quickly this all occurs depends on your chicken’s previous state of health and many other factors. For example, breed plays a role and White Leghorns seem to have a far greater heat tolerance than other breeds. Understandably, thin birds fare much better than heavier, fatter ones, and it is often the biggest birds of the flock that are lost first in a heat wave. Also, non-laying hens are better off than layers, and males are better able to cope than females. If you plan ahead, the way you build your backyard chicken coop can have direct effects on overall heat and humidity problems. Build your chicken coop on a hilltop. Situate windows and the open side of your coop to run from east to west so that the sun never shines directly into the chicken house. Use wide overhangs at the eaves. Use the roof; its angled edge will reflect MORE heat at the hottest time of the day if the face of the coop is not directly facing the sun. Evaporative coolers: These are very effective, but only when your chicken coop is completely enclosed. If your coop has several windows or open sides, these type of coolers will not work well. Air movement: Fans that will turn to blow directly into the chicken flock are an advantage in ANY type of coop. Fans that cause air turbulence in the pen, combined with slatted floors that give them free air flow from below, can markedly improve the well-being of an overheated chicken. Fans work especially well in open-sided coops situated in areas that have high humidity. Roof sprinklers: If you have a generous supply of water on hand, and do not mind an excessive water bill, this method is extremely effective. It works by spraying water on the coop roofs and walls, and evaporation carries away the heat. Foggers: These are similar to evaporative coolers and only work in buildings that are completely enclosed. They are also not as practical as other cooling methods due to the fact that they have a tendency to wet the ground and create a mess. 1. Before it starts to get hot, take preventative measures! Spare waterers should be ready and on hand. When the weather starts to warm up, act QUICKLY to bring relief to the chickens BEFORE the heat causes excessive stress. After a couple days in higher temperatures, the flock will slowly become accustomed to the hot conditions and will not need as much help. However, if you do not react rapidly, your flock could suffer dire consequences. 2. Your coop’s litter can act as an insulator and may trap heat. To prevent this, decrease the litter volume and height to no more than two inches above the floor. 3. For waterers, a fast, cost-effective and simple way to supply more birds with more water is to use pans (and buckets, pales, pitchers, etc.) and fill them with water. Placed strategically around the chicken house, it can cool down the environment and provide refreshment to your birds. 4. If the humidity becomes too high for evaporative coolers and foggers to work effectively, use fans! Place them so that they blow directly into the flock, thereby helping displace heat. 5. Keep the water cool! Plan ahead and bury water supply poles deep enough in the ground so that they are not warmed by the sun’s rays. Also note that warm water is better than no water. 6. If you have artificial lighting fixtures installed in the coop, turn them on very early in the morning (around 2 a.m.). This will allow your chickens to feed and drink while it is still cool. Remember that due to the day’s extended length, it cannot be rapidly reduced again or else the layers’ egg cycle will be disrupted.Only use this measure as an emergency option. 7. A supplementary vitamin pack, mixed in with the flock’s water, can do much to alleviate the flock’s stress and keep up the chickens’ vitality. 8. As a last relief method, spray the birds directly with water. If you find a chicken who has collapsed due to stress, dip it in a bucket of cold water. 9. If you need additional waterers, and don’t have any pans or buckets available, use the feed troughs! 10. Plan ahead by not letting your chickens become obese (since larger birds are affected by the heat sooner). 11. If you are raising layers, remember to gather eggs more frequently in hot weather. Spoilage occurs rapidly in high heat. 12. If you are using fans and other cooling equipment, make sure they are all working properly BEFORE the heat strikes! 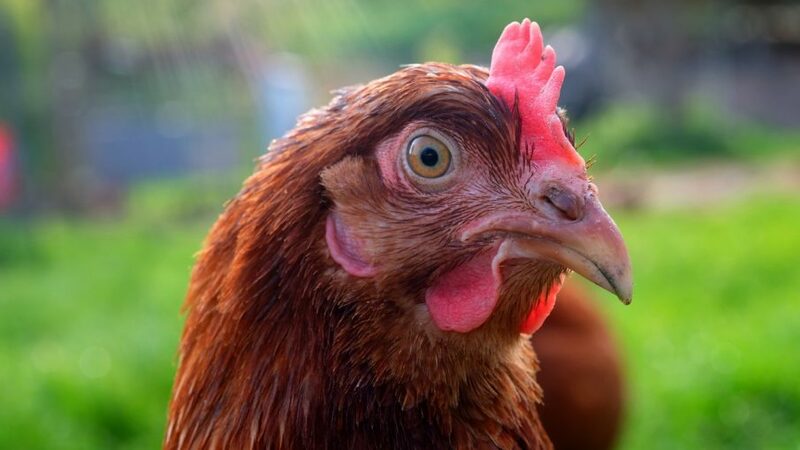 WHAT ARE SYMPTOMS OF HEAT STROKE IN A HEN?? Also, putting the coop under some trees helps a lot too. Mist hoses help also. I too think thus, perfectly indited post! Mister Mister Mister. You can buy the single one that hooks to the end of a hose and it is reasonably priced. It can cool an area down 10-25 degrees. I have 4 pallets set up like a tent. Shade cloth on one side and the mister on the shady side. It is fantastic! I could post a picture f my set up but this does not allow that.